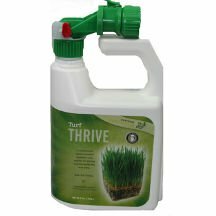 One of the newest items in our store is an organic product called Turf Thrive. In cooperation with plant fertilizers to improve your lawn, Turf Thrive works by adding living organisms to the soil called mycorrhizal fungi. What are these, you ask? Mycorrhizal fungi are an important part of the soil life. They attach themselves to the roots of your grass, effectively making the roots longer. The fungi help your roots absorb more water and nutrients from further away. Lack of water and nutrients can cause stunted growth and brown patches, so the fungi are very important for the health of your lawn. The fungi are beneficial in other ways. They help your plants fight against toxins and other contaminates in the soil. They also help protect against overly acidic soil and make the plant more resistant to diseases. Think of the fungi as your lawn’s best friend. Usually mycorrhizal fungi occur naturally in the soil. However, if the soil has been tampered with, including tilling, removal of topsoil, erosion and the application of fertilizer, fungicide or pesticide, the normal fungi in the soil can be affected. Turf Thrive returns these natural fungi that overworked soil has lost. It is not a full replacement for a plant fertilizer, but a compliment to it – Think of them as the dynamic duo of healthy lawns. Composting is the natural process that turns organic material like leaves, grass clippings and twigs into a dark rich substance that is fantastic for lawns and gardens. By adding compost to your Zoysia lawn, it will help the grass grow in thicker and healthier. This is because an organic matter in the compost helps soil retain nutrients and water. As opposed to some fertilizers, composting won’t burn your grass if you accidentally use too much and it won’t stain your walkways or concrete patios around your lawn. It is also prone to show results quickly. Compost can be used as a natural fertilizer for planting new lawns or for maintaining your existing lawn. When distributing compost across bare ground for a new lawn, be sure to use a generous amount. Mix 4 to 6 inches of compost into the soil. Once the grass plugs are planted, thoroughly water the area. When distributing compost across your existing lawn, place piles of a shovel-full throughout your lawn about one foot apart. Using a rake spread the compost throughout the lawn until the compost is in a thin layer about ¼ to ½ inch thick. A thin layer of compost will break down quickly, releasing nutrients into the lawn without smothering your grass. After the compost is distributed, water your lawn well. Compost works as a conditioner to your lawn, keeping it healthy and green. It is safe, organic, and with just 1 – 2 applications per year it can make a significant positive impact on your lawn’s health. Interested in composting? Read more about how to create compost from grass clippings to use on your Zoysia lawn.